In Japan, Karai is walking down the street when a biker suddenly shoots her in the shoulder. 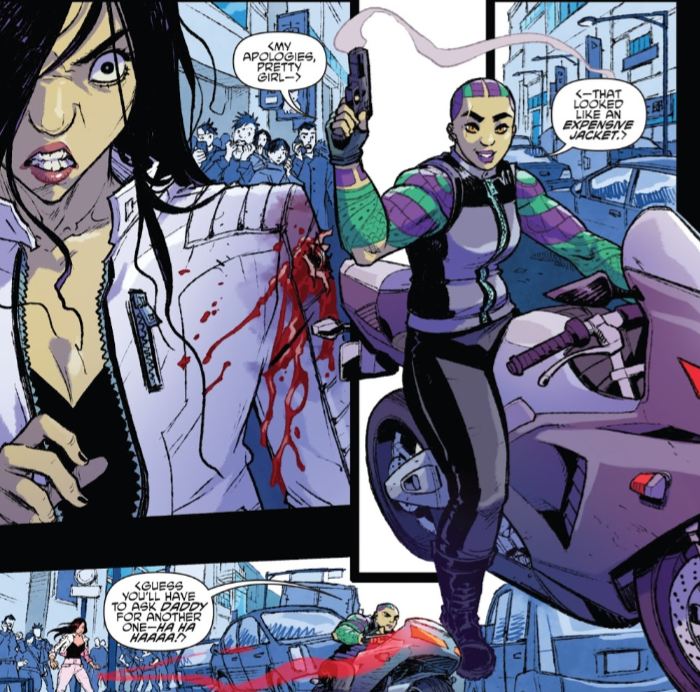 The biker taunts her and tries to make a getaway, but Karai knocks her off the bike and demands answers. The biker says that she's part of a Yakuza gang war and Karai happened to step in front of her target. The biker then shoots at Karai but deliberately misses; the shot only a feint so she could make her escape by hitching a ride on a passing truck. At Karai's penthouse, the Foot Clan instructor Toshiro is busy trying to help the injured Koya (who can no longer fly) and Bludgeon (who can no longer see) get their fighting instincts back. Both are reluctant to learn, but Toshiro proceeds to blindfold himself and confirm his inability to fly, asking if he's any less dangerous as a result of such handicaps. They attack him and he defeats them, proving that even without such abilities, one can still be a deadly warrior with training. Karai then stumbles in bleeding and collapses. Later, Karai awakens, having been tended to by Toshiro. Toshiro asks Karai why she walked away from the Foot Clan, having fought so hard to restore it to glory, and Karai says she's simply beginning a new chapter in her life. She asks Toshiro why he followed her when she left and he explains that he owes her more than he can repay. Karai then gears up and leaves, as she intends to get revenge on the would-be-assassin who shot her. At the rooftop garden of Hayashi Toru, the crime lord is having dinner with his daughter, Natsu, who happens to be the biker that shot Karai. She tells her father of what happened and he's pleased to learn that a high ranking member of the Foot Clan has returned to Japan. He hopes to do business with her in regards to the current gang war. In the not to distant future, Koya is languishing in a snow-covered tree, feeling sorry for herself and her loss of flight. She is clutching a bird-shaped talisman which begins to glow and attracts a bolt of lightning that strikes the tree. Koya survives and the talisman begins to speak to her. First it says "wind" and then begins filling her with energy. Koya then hears a voice say, "Make me your prey," and finds herself in the presence of a giant bird. *This issue is continued from TMNT Universe #11. This story continues in TMNT Universe #13. 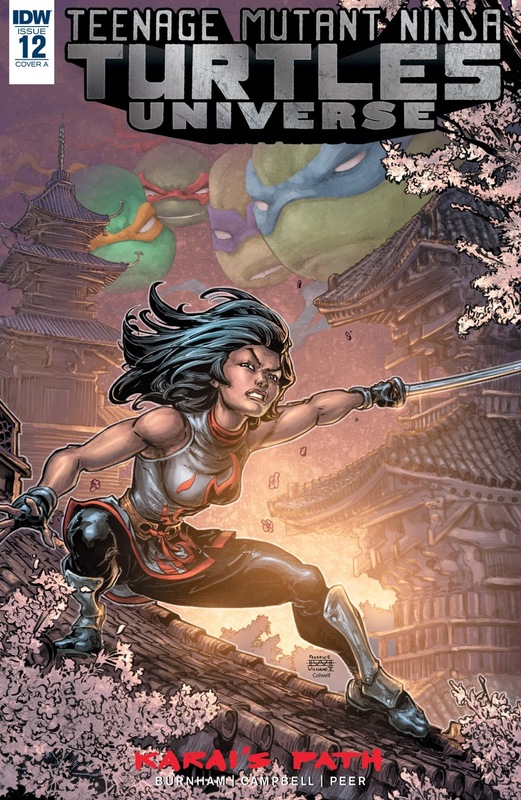 *Karai returned to Japan after Splinter took over the Foot Clan in TMNT (IDW) #50. Koya was grounded by Leonardo and Bludgeon was blinded by Donatello in that same issue. 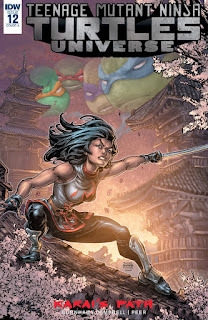 *How Karai restored the Foot Clan after her father ruined it was told in TMNT Villains Micro-Series #5: Karai. Toshiro also first appeared in that issue. *According to Erik Burnham, the biker girl was originally going to be a new version of Tatsu (from the live-action film series). However, upon being told that the character and name were off-limits, they renamed her Natsu. *This issue was originally published with 3 variant covers: Cover A by Freddie E. Williams II, Cover B by Tom Whalen, and Incentive Cover by Campbell. Hey, have any of you realized it's been almost two years since we last saw Karai and the Foot Mutants? TMNT #50 was in October, 2015. Time flies (but Koya doesn't). I'll be honest and confess that I hadn't stopped to think about what Karai was doing over the past twenty-one issues of the main series. She left to go to Japan and we haven't heard a peep from her or her menagerie since. I kinda just put her out of my mind. But for those of you who HAVE been dying to find out what Karai's been working on, "Karai's Path" ought to be good. This looks to be one of those "How ____ Got their Groove Back" type of stories, as Karai finds a new direction since losing the Foot Clan and Koya and Bludgeon relearn how to fight. In a way, it's like the Foot Clan's turn at enduring a "Northampton" storyline. They've been beaten, injured, forced out of New York and now they have to build themselves back up again in seclusion. Whether Karai and her team will be returning as enemies or allies remains to be seen, but it's still a neat twist on an established TMNT storyline we've seen multiple times throughout the franchise history. There's also hope that Koya and Bludgeon will get some personality now that we have a storyline centering around them. Koya has a bit more to work with since she's had more page-time over the years; we already know that she's arrogant and has a short temper. Bludgeon is the one that REALLY needs some exposure. I don't think I could describe in one sentence what his "personality" is supposed to be, and that dude's been around since issue 37. When I saw that Campbell was being credited as a writer, I felt a tinge of dread. Campbell is a fantastic artist, but a very amateurish writer. See TMNT #66 and TMNT Universe #10 for more on that. Luckily, one of the best writers in IDW's TMNT brain trust co-scripted this issue, Erik Burnham, so the inadequacies with Campbell's usual scripting (BAD dialogue, chiefly) are ironed out or absent altogether. It's a tight opening chapter that sets up the characters and their predicaments, but does it gracefully. No info-dumping exposition to the audience or characters reminding each other of obvious facts for reader benefit. Not even an editor's note saying "see issue ___". The reader is left to decipher the situation and relationships based on context and I appreciate the faith in my intelligence to do so. Campbell's art is good stuff, as usual, with excellent draftsmanship and layouts. During the fight scenes, a lot of the moves traded back and forth look like something straight out of Street Fighter II (I'm pretty sure we get a flash kick and a shoryuken). The homages are... direct, sure, but humorously appropriate for a story set in Japan. 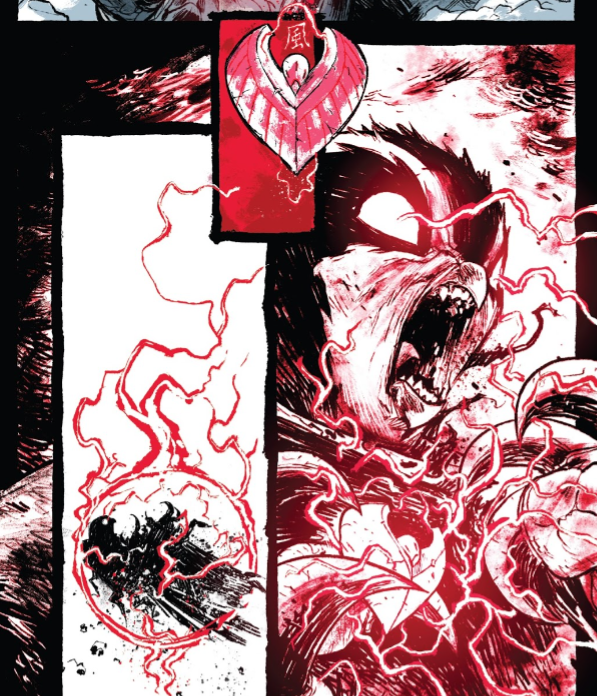 Brittany Peer's colors are really something, too. She limits the palette almost entirely to whites, blues and reds, with other colors (like the green and purple on Natsu's tattoos) used sparingly and for emphasis. It really pops. The contrasting whites and reds intimate the Japanese flag, of course, but the whole thing actually looks like it was influenced by the aesthetic of the Mirror's Edge video game series. The back-up is, I guess, a character study on Koya? The setting of "the near future" leaves me guessing that the context of the bird talisman will make sense later. She still seems to be suffering with her depression over being grounded, so I assume this back-up will act as her companion storyline explaining how she gets over it. Could be good (though, again, Bludgeon is the Foot Mutant more desperately in need of an expanded personality... or ANY personality). "Karai's Path" is getting off to a good start. While part of it is gratifying, seeing the Foot go through what the Turtles usually have to, Karai is an important character to both the franchise and the IDW mythology, and she has been long overdue to make a comeback. There are a lot of places her titular path might lead and I'm interested in seeing where she goes (so long as it leads her back into the main book). IDW's Karai has definitely been low-key compared to all the other Karai's. I wonder if IDW just didn't know what to do with her for awhile. Her absence felt weird but again you barely noticed she wasn't there. 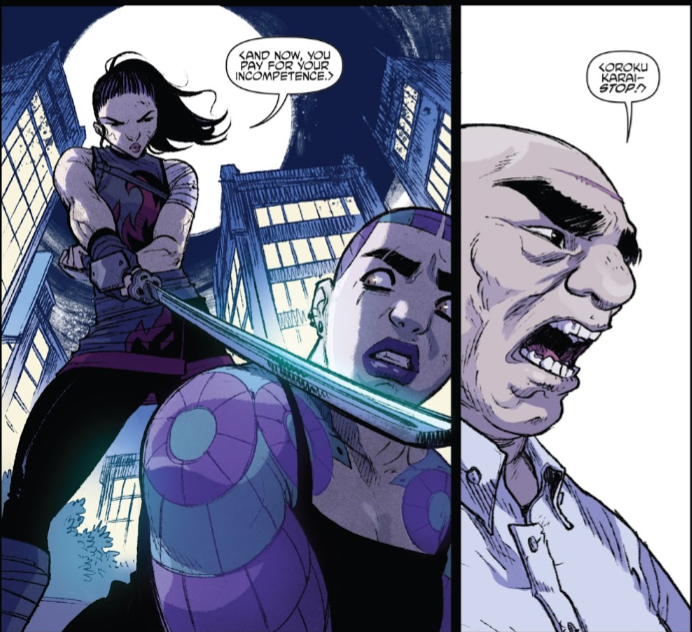 A bit of a shame, unless something significant happens with her in this arc or when she comes back to NY, she might wind up being one of the more forgettable incarnations of Karai. Considering how well IDW has done with almost every other old character they reinvented, it's a shame they dropped the ball with her. I didn't realize that it has been two years since we last Karai (probably because of that IDW TMNT game that came out with mediocre reviews). 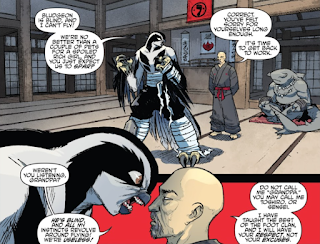 I am glad that IDW has taken the time to expand upon the Foot Clan since other versions of them are usually just forgotten or just show up sparingly. It will be interesting to see what happens when Splinter's faction meets up with Karai's in the future. I also would like to see why Karai cares so much about her clan. Maybe a glimpse into her past and what gives her the drive to try and lead such an organization (hopefully other than the cliched, "She is duty bound"). It is great that IDW is doing this because they really build upon the universe. This is why I am excited that the Sonic franchise has switched over to IDW. I am hoping for a somewhat mature Sonic comic that deals with Robotnik's industrialization of the planet. We might even see a cross-over of Sonic and the TMNT! I think the reason why Karai wants the foot to thrive is because it is all she has left. Her father is dead, shredder is dead and most of the foot clan are now being led by Splinter. karai doesn't just want a purpose, she wants a family. That seems like a good motivation for her, especially when you consider the strong themes of family in the TMNT universe. After this arc, karai and the foot mutants could act as a neutral faction, one that will help the turtles sometimes, but are not on their side completely. I hope this is the direction the writers take with Karai, because I do NOT want to see her become an ally to the turtles (remember how well that worked for the 2012 version).